Since the early 1990’s The Silencer® has been used successfully by dentists to help their patients, and sleep partners live a longer and more restful life. 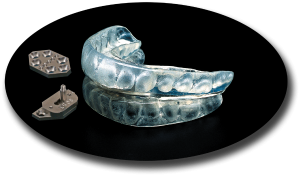 Invented by Dr. Wayne Halstrom, The Silencer as a snoring device features a key component milled from titanium called the Halstrom Hinge.™ It is this patented and remarkably simple, yet elegant design, that provides this oral appliance with it’s unique abilities. We thank you for visiting our web site. Dr. Halstrom receives prestigious award. Pro Player Health Alliance takes flight! Those with sleep apnea have a higher chance of developing gout. Enter your email below to keep track of the latest in Sleep Apnea information! Suite #507, 805 West Broadway, Vancouver BC V5Z 1K1 | 1 (800) 399-4659 | Copyright 2010 Silencer Products International Ltd.